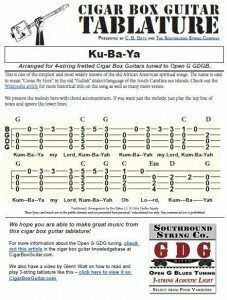 Spirituals & Hymns – The How-To Repository for the Cigar Box Guitar Movement! 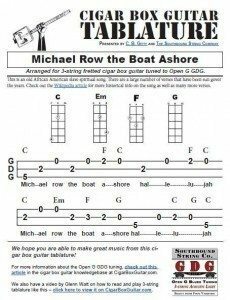 The tablature in the PDF link below will show you exactly how to play the melody and chords for the well-known spiritual song Michael Row the Boat Ashore. 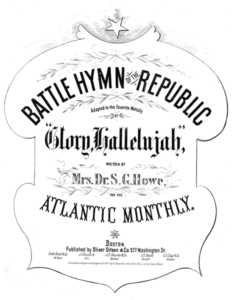 This is an old African American slave song, first documented around the time of the American Civil War. 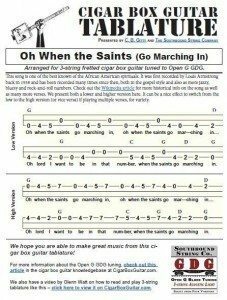 It is a very simple melody and has a large number of verses, and it’s easy to make up new verses on the fly. 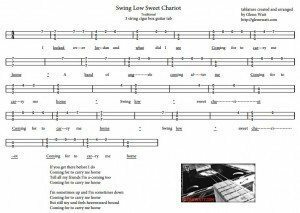 Swing Low Sweet Chariot is one of the best known African American spirituals/hymns, reaching back into the 19th century and still sung today. It can be played either as a slow, plaintive hymn or done faster in a more jazzy/bluegrass style if desired. More info about the history of the song can be found in the Wiki article here. This version of it has been arranged and tabbed by Glenn Watt. Glenn provides both the tablature and words for the song, as well as a video showing his take on how to play it. 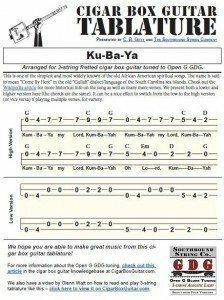 You can view the printable tablature sheet by clicking on this link or image below. 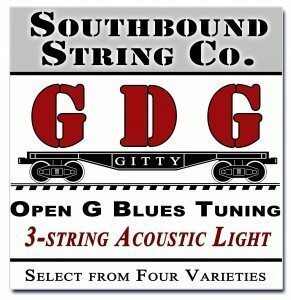 You can also watch the video below where Glenn shows you how he plays (and sings) the song in a fast bluegrassy style on his 3-string cigar box guitar tuned to Open G “GDG”. 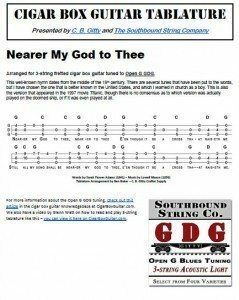 Click the image above to view the print-able tablature sheet. 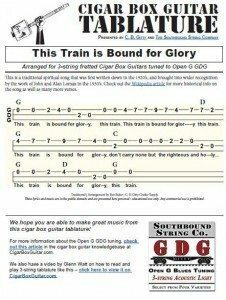 The tablature in the PDF link below will show you exactly how to play the melody and chords for the well-known spiritual This Train is Bound for Glory on your 3-string Cigar Box Guitar tuned to Open G GDG. This song was first written down in the 1920’s, and was popularized by John and Alan Lomax including it in their field recordings from the 1930’s. It has also been called one of the foundational songs of Rock and Roll – see the Wikipedia article for much more information.